For the numbering of files Rename Expert offers many setting options. You can choose between a consecutive numbering or a random order. The initial value already includes the number of leading zeros and may comprise, for example the value "001" or "1000". The number of leading zeros of files with an existing numbering can also be adapted in the hindsight. 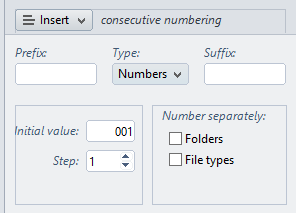 The amount by which the number increases after each application on a file or folder name is set via the parameter Step. Furthermore it is possible to use letters for numbering (e.g., "AAA") instead of digits. Folders and file types can be numbered separately. For files where the filename consists of repeating values, such as a date there may be used a conditional numbering. This is only inserted into the file name if the name is already taken.